Gingher 8" Knife Edge Bent Trimmers Fine Italian quality The knife edge on Gingher’s 8” Knife Edge Bent Trimmers is incredibly sharp and great to use for cutting layers of fabric. The 200 gram weight of these trimmers is comparably heavier than others on the market, which makes the handle feel better balanced than competing plastic-handled scissors. What is the difference between scissors and shears? 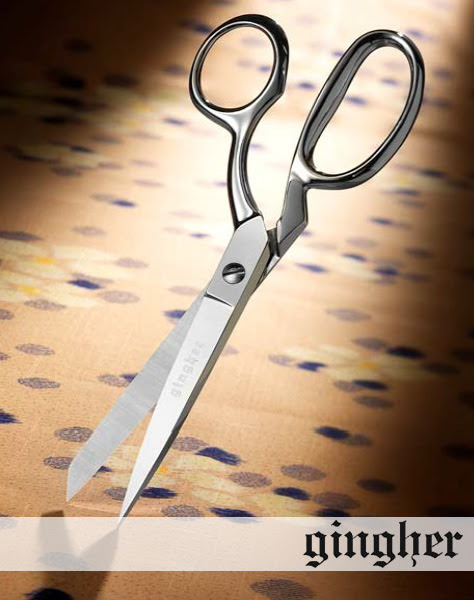 Scissors are the cutting instruments which have two identical bows or finger rings in the handles. Shears have one bow which is larger than the other one. Scissors are usually 6 inches or less in overall length. Shears are usually at least 6 inches or longer in overall length. Why are there so many patterns of scissors and shears to choose from? There are many different patterns of scissors and shears because cutting tools are used in so many different ways. 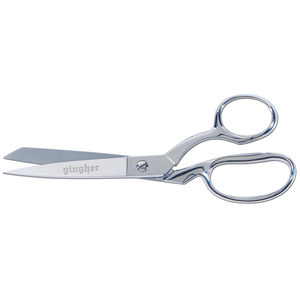 Gingher, Inc. offers a wide variety of over 250 different patterns and styles of scissors and shears to meet the needs of industry, home sewing and craft users. Items in the retail line have been carefully selected from our complete line to meet the exacting demands of today's home sewing and craft artisans. Through working with various industries, we have learned the importance of having the correct tool for the specific task being done. If an incorrect choice has been made in the tool being used, it usually has an adverse effect on both the results achieved and the satisfaction of the user. How long will my shears or scissors last? The performance and longevity of your scissors and shears will depend on how they are used, how often they are used and the care they are given by the user. If your scissors or shears are not abused, misused or accidentally damaged and are given the proper care, they will last for many years. Proper maintenance, including repair service when necessary, will further extend their lifetime and insure optimum performance. Why should an expensive high quality pair of scissors or shears be damaged just by dropping it on a hard surface? 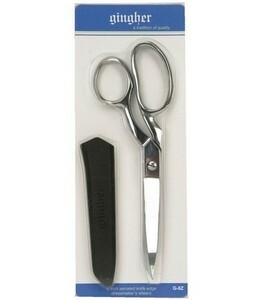 It is not possible to make scissors and shears which cannot be damaged by dropping. When the scissors or shears hit a hard surface and the blades are partially open, one cutting edge digs into the other at the point of impact causing a nick or damaged place on both cutting edges at the point. The damage will be more pronounced with knife edge scissors and shears. It is necessary to avoid dropping your scissors and shears to prevent this type of damage. Why are the blades of my scissors or shears bowed so that when viewed from the side I can see light between the blades? This does not mean they are defective in any way. Forged scissors or shears must have bow and twist in the blades to insure that the cutting edges will make proper contact - two flat pieces of steel screwed together would not cut anything because the cutting edges would not be making contact with each other. When your hold a pair of properly adjusted forged scissors or shears up and look at it from the side, you should be able to see the light through them. If you open the shears all the way and slowly close them, you should be able to see the two cutting edges making contact as you close them. Words like "warped" , "bowed", and "sprung" are usually used by the amateur repair person to explain why the shears are damaged after he has improperly reground the cutting edges and they are no longer working. Use of these words is an indication that someone does not fully understand how forged scissors or shears work. We truly love them both. It's our very first set of world class shears. Silky-smooth cutting. Great price. Everything worked well through ordering over the internet. Very pleased with all aspects. I will be back. Thank you so much for getting back to me. I checked with the Credit Card company and YES the $5.00 coupon was credited. My apologies for not checking there first. Have ordered three times from ALLBRANDS.COM and have been very satisfied with the service, prices and products.